Above: Paleohori, mid 1920's. 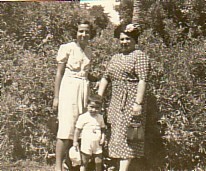 Marina is standing with her aunt, Kouzinia (right). 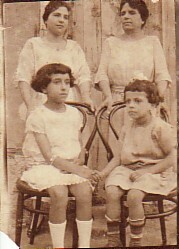 Seated are Kouzinia's daughter, Eleni (left) and Evangelitsa. 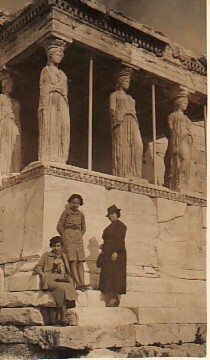 Above Right: Visiting her brother, Christos, in Egypt, 1925. With Christos (standing) and his adopted parents, Maria (standing) and Joseph Zaccar, and her daughter, Maria. Above: Athens, 1936. With her niece (seated) and her daughter, Maria. Marina and Maria were staying in Athens at the time, while they were preparing to migrate. Above Middle: With her brother, Christos. Above Right: With her daughter, Maria, and her step-brother, Charlie Mouhtouris, from the United States of America. 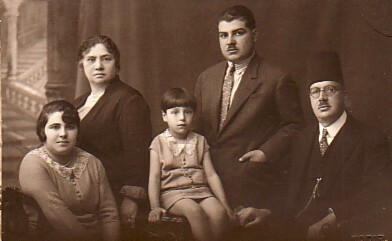 Above: With her daughter, Maria, and her nephew, Joseph Mouhtouris. 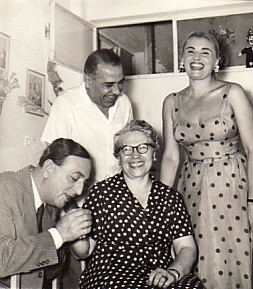 Above Right: With her brother, Christos, and visiting Greek actors, Vasilis Logothetidis and Ilia Livikou.